Found in the Stroke palette under a sub-palette of the same name Sculptris Pro of­fers a few options that are important to understand if you want the best control over your sculpting or to start creating your own brushes. Users will find their own preferences for which options are enabled or disabled – especially when it comes to the Combine option. We recommend testing the different Sculptris Pro options to see what fits your individual needs. 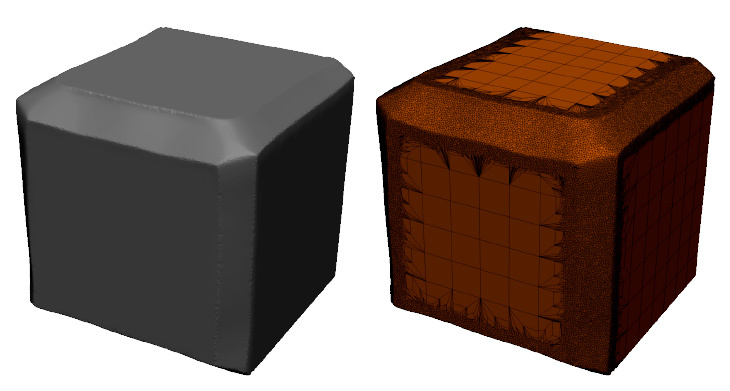 On the left, a cube with a low polygon density. On the right, a bevel has been manually sculpted with the Trim Dynamic brush. Notice the addition of polygons generated on the fly by the Sculptris Pro mode, removing the need to subdivide the model. Enabled by default, Adaptive Size instructs ZBrush to tesselate the model more or less strongly based upon the Draw Size. The smaller the radius of the brush, the more dense the topology will be and the larger the brush, the larger the polygons. Adaptive size in action. Above, a large brush stroke and below, a smaller size brush stroke. All other settings are the same between the two strokes. Notice the difference in topology density. When disabled, tessimation applied by the brush stroke will no longer be modified by the brush size radius. Instead, it will only use the Subdivide Size and Undivide Ratio set­tings. (The latter requires that Combined mode be enabled.) The density itself is mainly controlled by the Subdivide Size slider. When Combined mode is enabled, ZBrush will mix both tessellation and decima­tion while sculpting, constantly maintaining the proper number of polygons to support your brush strokes and details. Combined mode uses the Subdivide Size slider value to tesselate the mesh while at the same time using the Undivide Ratio value to remove unnecessary polygons. This function serves to avoid having extra polygons in your model while also clean­ing your topology. Keep in mind that when using this mode with high density meshes the stroke can be slowed down due to the fact that ZBrush needs to perform two complex operations at the same time. Some artists prefer disabling Combined mode to increase performance, relying on the Smooth brush to reduce the number of polygons when desired. The Subdivide Size slider only functions with brushes that are compatible with Sculptris Pro. It defines the density of tessellation applied to the mesh during the stroke. A low value creates dense tessellation (smaller polygons) while a high value creates a sparse tessellation (larger polygons). If Adaptive Size mode is turned on, this slider’s effect is modulated by the Draw Size value. The Undivide Ratio slider defines the amount of decimation applied to your brush stroke. The purpose of the Undivide function is to enhance the quality of the stroke and avoid adding unnecessary polygons. The Undivide Ratio function can be disconnected from the sculpting strokes by dis­abling the Combined toggle. By doing so, you will improve the brush stroke reactivity and speed. A low value will decimate only the smallest polygons within the area of your brush stroke, making the effect visible only in dense parts of the model. A high value will decimate larger triangles, making the optimization visible even in less dense areas of the model. The Smooth type brushes use the UnDivide Ratio value to produce decimation and smoothing at the same time. However, if the model has a lower density than the current Sculptris Pro settings, these brushes will add whatever polygons are necessary to pro­duce the effect, similar to a regular sculpting brush. If you want to apply variable polygon density or locally remove some polygons with­out affecting the details, you can create a new Smooth brush by using the Brush >> Clone function and then set a Z Intensity value of 0. In this case, tessimation will be ap­plied without any mesh smoothing. When used with Sculptris Pro, the Smooth brushes also have a secondary behavior accessed by releasing the Shift key while still maintaining the stroke. This will create an additional inflate effect that allows you to smooth the surface while also avoiding unwant­ed shrinking. An example of when it is useful would be when doing long deformations with the Snake Hook brushes, which grow thin at the ends. By default, Sculptris Pro takes the lead with all compatible brushes. This means that they will locally tessimate your model based on the global Sculptris Pro settings found in the Stroke palette. However, it is possible to customize each brush to have its own unique settings, giving you better control for your specific needs. You can access these settings in the Brush >> Sculptris Pro sub-palette. By default, brushes are set to use the global settings. Here is a description of these settings. This overrides the Sculptris Pro button for the current brush. In other words, if En­able is turned off then the brush will not tessimate the model even if Sculptris Pro mode is turned on. As an example, you might decide that you never want a special hPolish brush that will never tessimate your model, even when Sculptris Pro is turned on. In that case, sim­ply turn Brush >> Sculptris Pro >> Enable off and save the brush as a new one. When enabled, Use Global tells the brush to use the Sculptris Pro settings from the Stroke palette. When disabled, the Adaptive Size, Combined, SubDivide Size and UnDi­vide Ratio settings in the Brush >> Sculptris Pro sub-palette will become available to you and will affect only the current brush. For all brushes, Use Global is turned on by default. However, the option is available to you in case you want to customize a brush to act in a unique way by having stronger decimation or less tessellation than what is provided by the global settings. These settings are exactly the same as those found in the Stroke >> Sculptris Pro sub-palette (explained above in this chapter). The difference is that here they are applied only to the current brush. 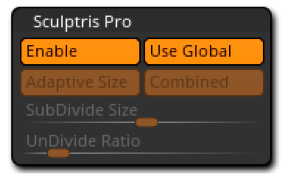 When Use Global is disabled, these settings will override the global Sculptris Pro mode settings. Sculptris Pro has been optimized for performance and reactivity. However, unlike with traditional subdivision surfaces, ZBrush must fully analyze your surface with ever brush stroke. This means that the more polygons you have, the less responsive your brush strokes will be. CPU performance has the greatest impact on this. Depending on your computer you may start noticing a reduction in performance anywhere from as few as 200,000 triangles to as many as 4 million. If you want to increase your performance you can disable Combine mode in the Sculptris Pro settings. Since ZBrush will now only need to perform tessellation rather than tessimation you will see a performance boost. Removing the decimation part of the operation won’t have a high impact on the visual appearance of your model. Just keep in mind that you will want to Smooth the surface every so often in order to clean up the mesh by removing unnecessary polygons (which also boosts performance). Don’t forget that you can always work with multiple SubTools. And if you are simply refining your shapes you can disable Sculptris Pro altogether. Use it when you need it and turn it off when it doesn’t enhance your work. Because Sculptris Pro produces triangles and can modify topology on the fly, using the Decimation Master plugin can be very helpful to drastically reduce the polygon count of your model while keeping details where needed. If you feel that your brush strokes feel less reactive because of the polygon count, you can try to decimate to approximately 20%. Visually, you should see little if any change in the appearance of your model. But since your polygon count is now 20% of what it had been before decimation you will get a significant boost in performance as you continue to sculpt. It is accessed through the ZPlugin >> Decimation Master sub-palette. Click the PreProcess Current button. This creates a temporary file, which may take anywhere from seconds to a few minutes. Set the decimation value using the % of Decimation slider. A value of 20 in­structs ZBrush to reduce the total polygon count by 80%, keeping the remaining 20%. Press the Decimate Current button. At this point your model will be decimated and you should see the point count at the top of your UI drop dramatically. For most models, 20% will not produce any visual change in your model. You can try different decimation values if you wish, without having to do a new PreProcess. This allows you to try different values until you are happy with the decimation. After you have sculpted some more, it will be necessary to PreProcess again. Decimation Master also includes some presets for one-click decimation. If you press the 20k button, ZBrush will automatically pre-process the model and then apply whatever decimation is necessary to reach the target count. If you see unwanted visual changes in your model, click a different preset. ZBrush will then use the current pre-process data and adjust the polygon count accordingly. In other words, Decimation Master only performs a pre-process calculation when neces­sary, even when using the preset buttons. It is well worth exploring this feature! As explained above, most of the sculpting brushes included with ZBrush are compat­ible with Sculptris Pro. That being said, some brushes are at their most useful when using Sculptris Pro, such as the Snake Hook brushes. When Sculptris Pro is turned off, the Snake Hook brushes produce badly stretched polygons and often a lot of unwanted deformation. With the Sculptris Pro turned on, ZBrush can adapt the topology of the model during the brush stroke, making these brush­es perfect for growing parts out from a surface. ZBrush includes two SnakeHook brushes. The original one functions relative to the camera working plane (the canvas) while the Snake Hook 2 brush operates relative to the surface normal. Don’t forget that brush settings can be altered to change their behavior. As an ex­ample, Brush >> Curve >> Edit Curve will affect the pinch effect of these brushes while Brush >> Modifiers >> Brush Modifier will affect how much the stroke aligns to either the surface normal or the canvas. The Snake Hook Sphere brush designed specifically for Sculptris Pro. This brush creates a tube with a spherical base along your brush stroke. By default its direction is based on the surface normal, but changing its Brush Modifier setting can make it function relative to the canvas instead. Finally, some brushes like hPolish can work with Sculptris Pro, but won’t have an effect that’s much different than what you would get normally. Since that would be a case where you are taking an unnecessary performance hit, such brushes might be good candidates for you to experiment with turning off the Brush >> Sculptris Pro >> Enable setting as explained above.